Bench has a Friends & Family Event on now! Save 50% off the original tickets price on the entire store. Also if you spend $100 or more you can get $50 off your next purchase as a bonus! Enter the promo code FRIEND50 at checkout to get the discount or show the email from their newsletter to shop in-store. 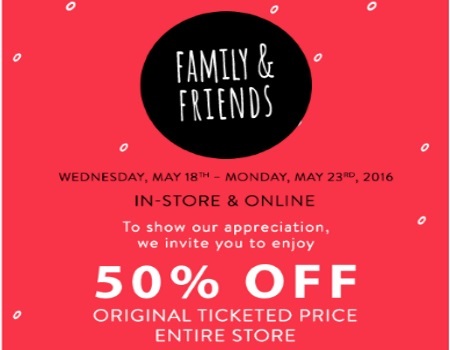 This sale is in-store and online Wednesday May 18-Monday, May 23, 2016. Edit - Extended one more day, valid until end of day today, Tuesday May 24, 2016. Click here to shop Bench.